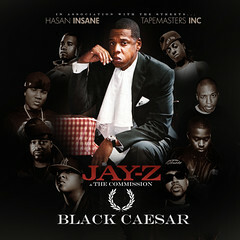 After crafting audible treats like an “Allure” remix with a sick saxophone and 16 bars from Nas for the An American Gangster Mixtape producer/DJ Hasan Insane is back with another Jay-Z inspired project entitled Black Caesar. At first glance it’s easy to think “damn, more American Gangster rehash?” But that was pieced together with older acapellas while this uses the “official” verses. Jay’s voice and flow is just perfect for remixing and it’s about time folks talked about Jigga without the words “and beyonce” following right behind. What makes Hasan’s remixes so good is his ability to find samples that match the mood of the original without sound anything like it. While his version of “American Dreamin” doesn’t knock the Marvin Gaye flavored original, it holds its own with a jazzy guitar loop, some drums that hit a little softer and well placed vocal scratches. In addition to his beats, Insane has a knack for adding guest vocals that is down right scary. For example, adding Big Boi and Pimp C to “Party Life” is an inspired touch that should give American Gangster some fresh legs going into the summer.